Part of the range of office desktop accessories, the filofax organizer, planner, writing case, A4 folder have both standard and custom designs. They are often augmented with pens or clutch pencils and custom writing pads. Preferences vary in whether an all-enclosing zip or press button is used for closing. A different type of an organizer constructed from the Valentino leather. There are seven slots on the LHS. 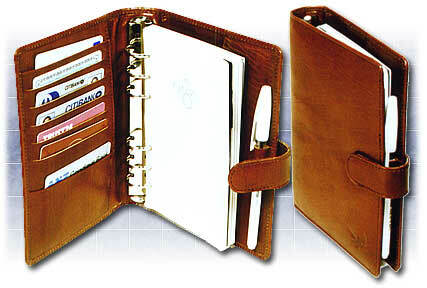 The top slot is a deep pocket to the bottom of the organizer and can be a place to keep Cheques or any kind of notes. The last pocket is for visiting cards. There is a side pocket located beneath the slots. On the RHS are the pen loop and a leaf slot. An elegant and compact writing case. The open LHS has a side pocket with a one-sided gusset and 2 side pockets for papers. 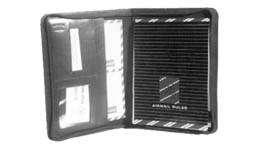 There is a plastic pocket to keep your visiting card, 5 credit card slots, one deep pocket besides an additional visiting card pocket. The centre has a pen loop. The RHS has a slot for an A-4 size pad. The back of the case has a pocket to keep your newspaper. Normally manufactured in Cow and Buff, we can have the interior in leather as well as leather foam. 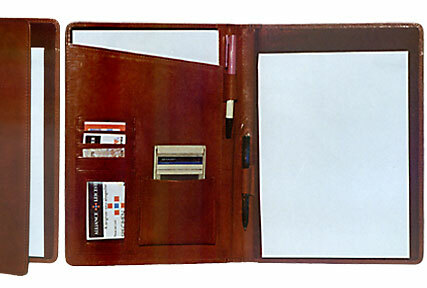 A writing case that is shut with a flap using an Amiet Lock. On opening, the RHS has a side pocket with a roomy gusset for files and 2 other side pockets for papers. 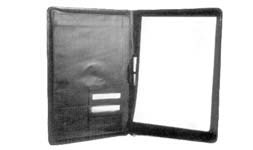 There is a plastic pocket to keep your visiting cards, 5 credit card slots, one deep pocket and an additional for visiting cards. The is a pen loop at the centre. The LHS has a slot to take an A-4 pad. This case is normally manufactured in Cow and Buff and we can have the interior in leather as well as leather foam. This leather organizer is the professional's companion. A tab and dome button system is used to close the product. 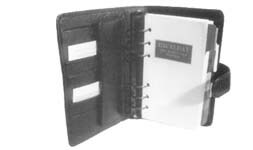 In the centre is a standard 6 ring binder for the diary. It has a press button pocket of 19.5 x 10 cm and a pen loop. On the LHS are 7 credit card slots and a side pocket. It is most suitable in Buff Leather but can also be done in cow. This writing case, made from soft cow nappa, has a zip closure The RHS has two leather strips at two ends to accommodate an A-5 pad. 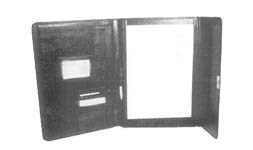 On the LHS there is one half pocket, a window for cards and one slot. It has a smooth velvet lining. A leather A-4 writing case. The RHS has a slot for the writing pad. There are two pen loops and the LHS has a flap pocket with three credit card slots and a deep pocket. There is a gusset compartment of size 9 x 10 cm for a calculator.